The very much awaited boxing fight between two promising famous boxers are now sealed and signed by Manny 'Pacman' Pacquiao and Floyd 'Money' Mayweather Jr. The contract is now sealed by international boxing committees. This could be another anticipated events in the history of boxing. Rep. Manny Pacquiao will fly soon to U.S.A to start training for his fight against the undefeated American boxer. According to Pacquiao, he still has enough time to prepare against the slick-fighting Floyd Mayweather Jr.
very enough for him and he avoid over-train. The unbeaten boxer was finally signed the contract for this Mega fight of the year. After 5-years of waiting, Floyd Mayweather Jr. decided to start this welterweight showdown boxing history between him and Pambangsang Kamao. Friday, February 20, 2015, Mayweather announced in Las Vegas that the mega fight is set on May 2, and the deal is done. Mayweather said, "I promised the fans we would get this done, and we did. We will make history on May 2nd. Don't miss it! This is the signed contract from both fighters," according to ABS-CBN News. According to a report that Mayweather could earned millions and millions of dollars from this Mega fight. It's more likely, $120 Million or more for him and around $80 Million for Pacquiao. But either way, its not important to know what will be cost of this fight for this time, we as Filipino, we would like to know who is the "greatest fighter" between them. For the records, Manny Pacquiao, has a 57-5-2 record with 38 knockouts and Floyd Mayweather Jr. has a perfect record of 47-0 with 26 knockouts. 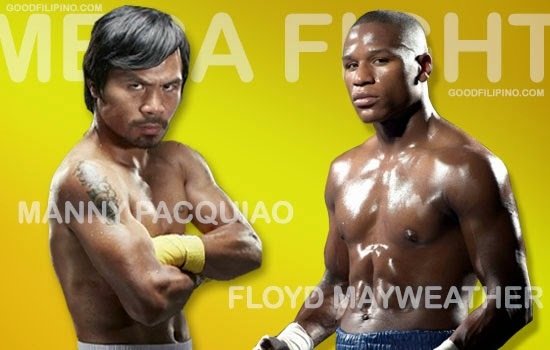 Comments or suggestions about "Manny Pacquiao vs Floyd Mayweather Jr. Fight set on May 2, 2015" is important to us, you may share it by using the comment box below.